One of my very first posts on this blog was concerned with the questionable doctrine put forth by Scott Hahn that the Holy Spirit should be understood as feminine and maternal. I blogged on this in my early days as a Traditionalist, when I was first learning about the pre-Vatican II liturgy and was only starting to see some deficiencies in the pop-conservative Catholic positions exemplified by EWTN and Catholic Answers. Since I had been led back into the Church by the writings and tapes of Dr. Hahn, turning to cast a critical eye on some of his assertions was a big turning point, a crossing of the Rubicon. I have great respect for Dr. Hahn, and I know him to be a man of great personal zeal and piety. I owe him a great debt for leading me back into the arms of Mater Ecclesia. However, even back then I saw his doctrine of a maternal Holy Spirit as dubious, a belief that has only intensified in the past three years if reflection. I pointed out then that Dr. Hahn's assertions had very scarce patristic support - he quotes an obscure Syriac called Narsai, a poem of Ephrem, and a saying of Aphraahat the Sage. These are hardly the type of sources to build a case upon! However, in the past few weeks I surprisingly came upon many more patristic references to the Holy Spirit as female. Looks like Dr. Hahn was right after all that a lot of persons in the ancient Church believed this proposition of the Spirit's femininity. The only problem was they were all gnostic heretics, at least the ones I came across; I admit there could be others I don't know about who support Hahn's view. If so, I should like to see them. In the Gospel of the Egyptians, a gnostic-Coptic work written in the 2nd century, God is referred to as the Father, the Son and "the Mother, the virginal Barbelon." Another contemporary gnostic work, the Trimorphic Pretennoia, we find a reference to "the Father, the Mother and the Son." 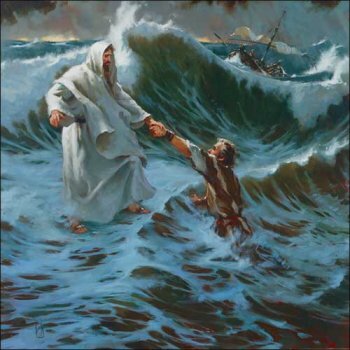 In the Apocryphon of John, a 2nd century gnostic work referred to by St. Irenaeus, a mystical voice announces to John the Disciple: "I am the one who is with you always. I am the Father; I am the Mother; I am the Son." The famous Gospel of Philip presents Christ as conceived by a union between the Father and the Spirit who is both Virgin and Mother. The author sees the spirit as essentially female (perhaps following on the fact that the Hebrew word ruah (spirit) is feminine) and attempts to rebuff the orthodox position by saying: "Some said, 'Mary conceived by the Holy Spirit.' These are in error. They do not know what they are saying. When did a woman ever conceive by a woman?" In the Gospel of the Hebrews, Jesus speaks of "my Mother, the Holy Spirit." In the Gospel of Thomas Jesus contrasts His earthly mother and father, Joseph and Mary, with His heavenly Father and His "divine" Mother, the Holy Spirit. Jesus is made to say that whoever becomes a Christian gains both a Father and a Mother, who is the Spirit. When we see how many early heretical writings saw the Holy Spirit as a feminine mother, we should not be surprised that Dr. Hahn can muster up so little genuine patristic support for his ideas. The fact that heretics believe something does not mean it is wrong ipso facto, but if a whole bunch of heretics profess something and none of the legitimate Church Fathers do, it ought to give you pause. I know it has been several years since Dr. Hahn made his remarks about the Holy Spirit. Perhaps he has modified his positions since, or clarified them; if anyone knows and can tell me, I would be grateful. In the meantime, I think we should continue to reject this idea of a maternal Spirit as dangerous and smacking of heresy until we get a better clarification from Dr. Hahn. While I don't want to condemn something outright that I don't understand, I also want to be wary of anything attempting to inject femininity into the Godhead. The other day I picked up the book The Holy Spirit: Ancient Christian Traditions by Stanley M. Burgess and have been quite enjoying it. The author is a Lutheran I believe, but he takes a pretty balanced look at the doctrine of the Holy Spirit (pneumatology) in the early Church. The premise of the book is that a Christian pneumatology was never adequately developed in the early Church due to the excessive focus on Christology and the Christological-Trinitarian disputes of the early centuries. The result (so the author says) is that the early Church never reached a true consensus on the place of the Spirit in the life of the Church, which gave rise early on to a rupture between those who saw the Spirit as continually present to the Church in its institutions, sacraments and liturgies (which the author calls the 'major tradition') and those who saw the Spirit as dynamically active supernaturally via charismata in the lives of the faithful (which he calls the 'minor tradition'). Thus there is a fundamental tension between charismatic and institutional. Though the "institutional" or major tradition eventually became dominant, the author argues that the charismatic (minor tradition) has always remained vibrant, and that the most fruitful periods of Church history have arisen when the two traditions "cross fertilize" one another. Nevertheless, an adequate pneumatology has never been developed and even to this day the divide between the institutional and the charismatic persists in the modern disputes over the proper role, if any, of the charismatic renewal within Christianity. It is an interesting thesis, but from a historian's point of view I can't say that it is entirely accurate. Those familiar with the writings of the saints of the early Church know that the 'institutional" Catholics never stated that the movement of the Spirit was exclusive only to the sacraments and the liturgy. St. Ambrose, St. Augustine, St. John Chrysostom and all the others all believed in visions, dreams, miracles, exorcisms and the like. According to the author, St. Cyprian is representative of the furthest end of the "major tradition" spectrum: one who sees the work of the Spirit as bound up with the institutional Church and the episcopacy. However, many of these great theologians, including Cyprian, emphasized the continued work of the Holy Spirit in the Church as evidence of Christianity's truth, citing miracles, dreams and other phenomenon that they themselves witnessed or heard from trustworthy sources. To say that the hierarchical "institutional" Church of the first centuries was altogether mistrusting of charismatic manifestations of spiritual gifts is simply false. On the contrary, they embrace them warmly when they are legitimate. But that last clause, "when they are legitimate" is essential. There are legitimate charismata and illegitimate charismata, a fact which allows St. Augustine to enthusiastically endorse the miracles and dreams of St. Amrbose while condemning the ecstatic visions of the Montanists. While there has never been a fundamental mistrust of supernatural phenomenon in the Church, there has indeed been a proper and just reluctance to accept over-enthusiastic manifestations of charismata which seem to reduce the work of the Holy Spirit to the level of the experiential. The second ogdoad power, the Mother, the virginal Barbelon epititoch [...] the uninterpretable power, the ineffable Mother. And the throne of his [glory] was established [in it, this one] on which in unrevealable name [is inscribed], on the tablet...one is the Word [the Father of the light] of everything, he who came forth from the silence, while he rests in his silence, he whose name [is] in an invisible symbol. A hidden, [invisible] mystery came forth iiiiiiiiiiiiiiiiiiiiiii [iii] eeeeeeeeeeeeeeeeeeeeee [ee o] ooooooooooooooooo uu [uuu] uuuuuuuuuuuuuuuuuuuuuuuuuu eeeeeeeeeeeeeeeeeeeee aaaaaaaa[aaaa] aaaaaaaaaaaaaaaa oooooooooooooooo [oo] ooooooooooooooo. What gibberish! This is perhaps the only record we have of what "tongues", or at least a heretical perversion of the true gift of tongues, sounded like in the Gnostic communities. While I can't say the theme of the book is correct, it is definitely worth reading if you have an interest in the early heresies, and this book takes you through a lot of the deviations and perversions of doctrine in the first several centuries of the Church that had to do with errant ideas of the work of the Holy Spirit. I don't think I agree that this division between institution and charismata is as fundamental in the life of the Church as the author says, but it is undeniable that these type of movements have plagued the Church at ever stage of its development. However, whenever a wacked out, overly-experientially based movement arises, I think it has less to do with a unresolved tension in the Church itself as to a popular reaction against Christians who fail to live and make use of the charismata that already exist in the Church. If all Catholics devoted themselves to prayer and fasting and were exemplars of holiness and piety, there would be little need for these fringe movements to pop up with their false promises of a more "authentic" experience of God (I'm not speaking here of the mainstream 'charismatic renewal', but some of this could apply to that movement as well). As has always been the case throughout history, the best remedy for heretical movements and fringe apparition-based groups is for the rank and file Catholics to live their faith to the fullest. I just came across this recently in a letter of J.R.R. Tolkien to his son Christopher, dated January 1945 (for those of you who have the Carpenter collection of Tolkien's letters, it is letter 92, pages 109-110). In the letter he deals with the story of the Garden of Eden and brings up a point that I have stressed many times before regarding Genesis: that regardless of whether or not one believes in a literal Creation, it is troubling that Christians are somewhat embarrassed by the literal interpretation and automatically jump to an allegorical interpretation in the face of modern critiques of the Scriptures. Nevertheless, the story's value "as a story" points to its literal truth and is a concomitant of this truth. This letter is also very important in understanding Tolkien's idea on the meaning of "myth" as essentially truth in veiled language, versus the modern use of myth as something untrue. But partly as a development of my own thought on my lines of work (technical and literary), partly in contact with C.S.L., and in various ways not least the firm guiding hand of Alma Mater Ecclesia, I do not now feel either ashamed or dubious of the Eden 'myth'. It has not, of course, the same kind of historicity as the NT, which are virtually contemporary documents, while Genesis is separated by we do not know how many sad exiled generations from the Fall, but certainly there was an Eden on this very unhappy earth. We all long for it, and we are constantly glimpsing it: our whole nature at its best and least corrupted, its gentlest and most humane, is still soaked with a sense of 'exile'. The "jungle" outside Calais, France, where hundreds of illegal immigrants were busted this week attempting to cross clandestinely into the U.K. This week the liberal presses throughout the world are decrying the "inhumane" treatment of illegal immigrants busted at the French port of Calais attempting to illegally enter the UK. As with most stories of this type, the emphasis is placed not on the fact that a substantial population is illegally squatting in a country and attempting to pass clandestinely into another one that does not want them, but rather on the "conditions" in French society that makes this type of behavior "necessary" on the part of the migrants. When illegals are busted, the French liberal presses are asking "What did we do wrong?" Unchecked illegal immigration is a bane on any country, and it is illogical to tell these host countries that they need to permit unrestricted access to all manner of illegals from God knows where to come in for any reason. The media is trying to turn this crackdown into a human interest story by focusing on the poor conditions that these migrants were fleeing from when they came to Europe. Some fled starvation in war torn Somalia, others were seeking asylum from reprisals by the Taliban in Afghanistan. The unstated point is that we are all expected to feel so very sorry for these migrants and extend our sympathy to them in their quest to illegally enter other countries. Let me return some sanity to this issue by pointing out that most countries have legal methods for persons to seek political asylum, and if such legal methods exist I can hardly see a justification for the type of clandestine, illegal operation these immigrants were attempting. Let's also be reminded that it is not as if the French police went out busting down doors and dragging these migrants out in the night; these immigrants were very publicly camping out in a tent city on the outskirts of Calais, in open and arrogant disregard for French law. The arrogance with which these illegal immigrants flaunt their crimes is staggering to me (and yes, sneaking into a country illegally is a crime just as much as sneaking into a house illegally would be). I am amazed at how they rally together by the thousands to protest for equal rights and care at the expense of the host country's taxpayers. When I see these rallies (like the one in Los Angeles a few years back), I stare at the TV flabbergasted and think, "Why doesn't the border guard surround this mob right now and start asking for Green Cards?" The more prosperous nations are obliged, to the extent they are able, to welcome the foreigner in search of the security and the means of livelihood which he cannot find in his country of origin. Public authorities should see to it that the natural right is respected that places a guest under the protection of those who receive him (CCC 2241). Political authorities, for the sake of the common good for which they are responsible, may make the exercise of the right to immigrate subject to various juridical conditions, especially with regard to the immigrants' duties toward their country of adoption. Immigrants are obliged to respect with gratitude the material and spiritual heritage of the country that receives them, to obey its laws and to assist in carrying civic burdens (CCC 2241). An immigrant is obliged to share in the civic burdens of society and show gratitude towards their host country - but how can they do that if they violate the fundamental integrity of that nation's laws by violating those very laws they have a duty to uphold in the act of entering the country? It is like if I man were to kidnap a woman violently so that he could force her into marriage; how can a true marriage, built on love and mutual respect, be built if the very foundation of that union is based on fear and violence? An immigrant cannot enter the country illegally in flagrant defiance of the law and then claim that they are law-abiding persons. A law-abiding persons abide by laws, especially laws that dictate who can and cannot enter the country. If we look back at Catholic (or rather I should say, secular medieval) tradition, we see that nowhere in history did kings, popes or prelates ever show the scruple they now show regarding the rights of immigrants. It was taken for granted in the Middle Ages that a king could close or open his borders as he saw fit. There were times when the Kings of England forbid anyone from leaving the isles (or from landing). There were many around who disagreed with these policies, but no pope or bishop ever denied that the king had a right to close his kingdom's borders if he so chose. Likewise in ancient Rome, during the closing centuries of the Empire when the border was constantly under siege by Germanic invaders, we hear nothing of any bishop or pope lecturing Theodosius or Honorius on any natural inalienable right of the poor Germans to migrate into the more prosperous Roman domain. It was taken for granted in the ancient world and the Middle Ages that the ruler of the kingdom could decide, with absolute authority, who could and could not enter the realm. Exception was made for ecclesiastics, of course, and the only papal condemnations of these restrictions of movement comes when the kings tried to stop priests from coming into their realms during various phases of history. But you would be hard pressed to show me an unmitigated right to immigrate in tradition. The reason for this is that for most of European history, the kingdom was regarded as the extension of a house; in many cases it literally was, if the nobles and the king were all of one bloodline. People swore allegiance to a personal king and saw him as a father figure, and the nation, the patria, was the extension of king's paternal authority. What the house was to the father the kingdom was to the king (at least in theory); hence the literal Latin for nation or kingdom is patria, or "fatherland." Therefore, to sneak into the domain of the king illegally was tantamount to breaking into a private home. Just as a private individual has the right to bar from or admit into his home whomever he chose and on whatever conditions, so too did the kingdom have this authority with regards to its own borders. I know many will say that the concept of the nation as an extension of the king's patrimony has passed away with monarchy, but it is still true that in the democratic society the state is still the "commonwealth"; i.e., the common inheritance of all. In effect, the situation is now that the nation represents the common inheritance of all its citizens, which is passed on and established by the sacrifices, legislation and labor of the prior generations. Just because monarchy has regrettably passed away does not mean we should stop seeing the nation as a type of "house" or extended family. Just as a person has a right to defend his own home from unwanted intruders, so a nation as a right (even a duty) to protect its own borders - to secure its own "house." To put this in context and bring it back to immigration: Let's say I break into your house. Let's say that when you discover me in your house, you insist that I leave. But I say, "I've made all the beds and washed the dishes and did the laundry and swept the floors. I've done all the things you don't like to do. I'm hard-working and honest (except for when I broke into your house). Now, here is the insanity in all this: according to those who support unrestricted illegal immgration, you are required to let me stay in your house. You are required to add me to your family's insurance plan. You are required to educate my kids. You are required to provide other benefits to me and to my family (my husband will do all of your yard work because he is also hard-working and honest, except for that breaking in part). If you try to call the police or force me out, I will call my friends who will picket your house carrying signs that proclaim my RIGHT to be there. It's only fair, after all, because you have a nicer house than I do, and I'm just trying to better myself. I'm a hard-working and honest, person, except for well, you know, I did break into your house. And oh yeah, I get a free education, where you have to pay your own way through college. I live in your house, contributing only a fraction of the cost of my keep, and there is nothing you can do about it without being accused of cold, uncaring, selfish, prejudiced, and bigoted behavior. This is absolute insanity. The state has a perfectly legitimate right to admit or not admit whom it chooses for whatever reason (so long as it has some legal process for getting people in, but even then I would say it would be justified in restricting immigration considerably). We also have to stop being duped by those who pull the rug over our eyes by focusing only on the human interest element of these stories. I know a Mexican immigrant from Tiajuana will probably be able to find a better life in the Midwest; I have no doubt that the Somalis arrested in France were fleeing poverty and war. These things may be true - but we cannot continue to focus narrowly on the plight of the individual immigrant and ignore the cumulative impact of millions of them. We are talking about movements of persons in the millions and millions, movements of populations not seen since the fall of the Roman Empire. Any nation that failed to see this problem cumulatively would be acting at its own peril; I'd say ignoring this problem would be suicidal. The Romans were ultimately unable to fight off the Germanic invasions, but they would have been even less effective had they saw each German as someone just trying to better himself and his family; at least the Romans had the common sense to see unwanted illegal immigration for what it is: nothing other than a foreign invasion. I also hope Catholics stop being duped by the argument that just because we are a "nation of immigrants" means that we must grant unrestricted and unlimited access to all immigrants until the end of time, as if there is no difference between settling an untamed wilderness and coming to a depressed economy with an already overflooded labor market; as if there is no cultural distinction between a largely homogenous European-Christian influx in the 19th century and the Muslim, Hindu and non-European immigration we see today; as if the fact that the verdant fields and limitless forests of frontier America were enough to sustain the immigrants of the 1800's means that the overtaxed, debt-ridden populace of the 21st century is able to accomodate an unlimited number of non-productive beneficiaries of state handouts indefinitely. Don't even go there with that "nation of immigrants" nonsense. Well, I've ranted long enough about this. The bottom line is that if you want to come in, obey the law and do it by the book. That's what any decent person expects of someone entering their home, and if we really believe that our country is a Republic (res publica - public thing or common work) then we'd be utterly insane not to expect the same of those pounding at our door. I'd like to hear especially from some of the readers in the UK - how do you feel about hordes of illegal immigrants crowding the shores of Brittany just waiting for their chance to sneak into your country illegally? Every time I do a post on here regarding a modern saint or beata, or discuss the modern canonization process, there are many readers who leave comments questioning whether or not a canonization is infallible. In this post I will attempt to show that canonizations are infallible pronouncements of the Church (in fact, the most common kind of infallible teachings). This infallibility is related to two distinct elements: the infallibility of the Roman Pontiff and the offering of the sacrifice of the Mass as a worthy and acceptable offering to God. [I]n order that we may satisfactorily perform the duty of embracing the true faith and of continuously persevering in it, God, through His only-begotten Son, has instituted the Church, and provided it with clear signs of His institution, so that it can be recognized by all as the guardian and teacher of the revealed word (D 1793). However, there is a secondary object of infallibility, which is not revealed dogma per se but truths of Christianity on faith and morals which are not formally revealed, but are so intricately bound up with divine revelation that to deny them would mire us in innumerable difficulties and lead to a denial of some aspect of divine revelation itself. 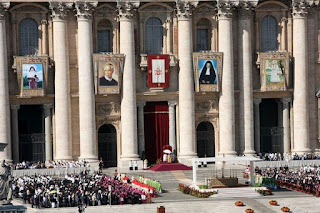 It is under the second object of infallibility that the canonization of saints belongs. Remember, the canonzation of a saint means two things: that the person is among the blessed in heaven and that they possess virtues that are worthy of imitation; i.e., they are a role model. Can you imagine the mess that would arise if, through errant canonizations, Catholics were led to admire and imitate persons who were among the damned? It is because of the confusion that would arise in the public worship of the Church as well as the devotional lives of private Catholics that canonizations of saints are considered a particular subset of the general infallibility of the Roman Pontiff. This comes to bear especially in the second part of the argument, that canonizations must be infallible because of the sacrifice of the Mass as an intrinsically acceptable offering to God. The Church is holy. Part of this holiness has to do with the holiness of her sacrifices, as mentioned above. Could the holiness of the Church's sacraments be preserved if the sacrifice of the Mass was offered in memory of men and women who were not actually in heaven? How could this be squared with the imminent holiness of the sacrifice of the Mass? Can you imagine a scenario where a saint is invoked in the Mass who is actually not a saint but in hell? (that's what it would mean if a canonization were errant) If this were the case, could such a thing be pleasing to God? Would it be consonant with the holiness and perfection of the sacrifice of the Mass for the Church itself to ordain the commemoration liturgically of men who are not really in heaven? It must be obvious, however, that while private moral certainty of their sanctity and possession of heavenly glory may suffice for private veneration of the saints, it cannot suffice for public and common acts of that kind (entry for Canonization). Following the liturgical argument, it is interesting to notice that this is also implicit in the fact that Rome does not recognize saints from orthodox communions who are not among her own. We share many saints with the east, like St. Athanasius, St. Anthony of Egypt, etc. However, there are many saints of the eastern calendar (or the Russian Orthodox, Coptic, etc.) whom we do not recognize. An example is Emperor Constantine, who is revred as a saint among Eastern Orthodox, Coptic Orthodox, Oriental Orthodox, and also Czar Nicholas II of Russia, who is invoked as Saint Nicholas the Passion-Bearer by the Moscow Patriarchate of the Russian Orthodox Church. We could also cite Pontius Pilate, who was considered a saint by certain Ethiopian Orthodox at one time. I think, as a caveat however, that this infallibility extends only to canonized saints (not beata or venerables), and that it pertains only to the final fact of canonization, not the motives for the canonization or the methods involved in the process. I think it possible that somebody can be declared a saint for the wrong motives; it is equally possible that someone can be declared a saint despite an insufficient amount of inquiry or improper procedure. I do not think these elements cancel out the canonization, however. 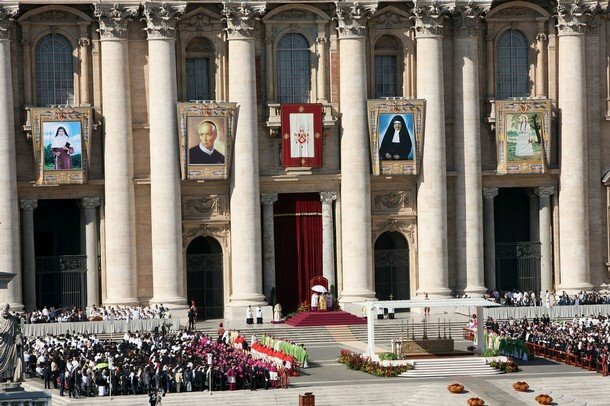 At the end of the day, whatever else might be said, if so-and-so gets canonized, the decree of canonization is infallible (that is, they are certainly among the blessed) even if the procedures that led to the canonization may have been errant or misled. I think this is what we see in many modern canonizations. To recap: canonizations must be considered infallible teachings of the Church's Magisterium because (1) their declarations are an extension of the infalbility of the Roman Pontiff due to their intimate connection with revealed dogma and the difficulties they would mire us in if they were not theologically certain, and (2) because of their connection to the sacrifice of the Mass, which is always holy and pure, inasmuch as if canonizations could be errant it would do damage to the intrinsic holiness of the sacrifice of the Mass, something that could not occur without imperiling the holiness of the Church's sacraments. The importance attached to the theological virtue of faith among many Protestants is well known. For most Protestants, faith alone effects our justification, and this of course was the rallying cry of Luther's revolt against the Catholic Church. For a lot of Protestants, faith is not just important, it is all important to the exclusion of any other considerations. My father in law, for example, once told me that nobody goes to hell for adultery or murder or thievery or any other sin - according to him, every person in hell is in there for not having faith. I guess you could say that it is true that if the damned had persevered in faith that they might have obtained the grace of final perseverance, but I don't think you could say everybody in hell goes to hell just because of lack of faith. But conversely, he would say that everybody in heaven is in heaven solely because of faith. So there are only those with faith and those without faith, and this is the determining criteria in who is among the blessed and who is among the damned. This is tricky, because there is a Catholic way we could understand this. Certainly nobody who does go to heaven does so without faith, and people in hell can be said to have been lost through a lack of faith. Yet this is not the case because faith alone in and of itself is intrinsically sufficient to effect justification in us - it is but one element in a series of things that lead to heaven, mainly in the sense that the virtue of faith, besides being pleasing to God, disposes us to receive the actual graces God wants to shower upon us so that we can be rendered fit for heaven. This got me thinking about grace and faith in Protestantism, and how among many Protestants, faith actually serves the same role that grace does in Catholic theology. For Catholics, grace is the very righteousness of God, according to the Council of Trent, "God's justice, not by which He Himself is just but by which He makes us just" (D 799). St. Paul likens grace to the very charity of God given to the elect: "The charity of God is poured forth in our heart by the Holy Ghost" (Rom. 5:5). Sanctifying grace is truly distinct from charity, though the Council of Trent spoke of grace in terms of charity (D 800). Like charity to which it is so closely connected, grace is a vivifying principle, something that renders one acceptable to God and empowers one to conform themselves to the image of Christ. Without grace, nothing we do can have merit, and all the good we do comes as a result of God's grace in us, either actual or antecedent to whatever good we perform. For in the sight of God faith is what really renders a person holy, and alone serves Him, but the works are for the service of man (145). ...men cannot be justified before God by their own strength, merits, or works, but are freely justified for Christ's sake, through faith, when they believe that they are received into favor, and that their sins are forgiven for Christ's sake, who, by His death, has made satisfaction for our sins. This faith God imputes for righteousness in His sight. Notice that in Catholicism, grace is defined as the righteousness of God communicated to man which in turn makes Him righteous and holy. This is almost exactly what Protestants believe concerning faith. Protestants today use the same language: works must be done "in faith" in order to be acceptable to God (and even then they don't have any intrinsic merit); trusting in anything other than faith alone is tantamount to arrogant idolatry, just as in Catholic it would be in Catholic theology to assert that man can merit without grace; faith is what is sought to get one through difficult trials and periods of darkness, just as we would implore God's grace; Protestants believe we are saved by "faith alone" and Catholics say the same thing about grace. In most aspects of Protestantism, faith is seen the way we view grace. Though faith plays the same role in Luther's theology that grace does in Catholic theology, there is a still greater difference. Grace is something external, objective and transformative. Faith, at least the kind Luther espoused, was internal, subjective and ultimately served only to give the sinner "imputed" righteousness. With all the tremendous emphasis on faith in Protestantism, both classic and modern, it would be interesting to see what role they assign grace in the life of the Christian. If faith is the operative element that accomplishes everything, strengthens the believer and makes his prayers and deeds meritorious, indeed even rendering us justified, what is there left for grace to do? Today is the Exaltation of the Holy Cross, which among other things commemorates second anniversary of the implementation of Summorum Pontificum. The motu proprio is one of a long line of historic events that have taken place on this day. We also have this wonderful little tidbit on the blessing and use of sacramental basil from Fr. Z's blog today. Review: "Bury My Heart at Wounded Knee"
This weekend I watched the 2007 HBO film "Bury My Heart at Wounded Knee", starring Aidan Quinn, Adam Beach, Anna Paquin and August Schellenberg. The film chronicles the waning days of the Plains Indians in the latter part of the 19th century, beginning at Little Big Horn (1876) and ending at the massacre of Wounded Knee (1890). 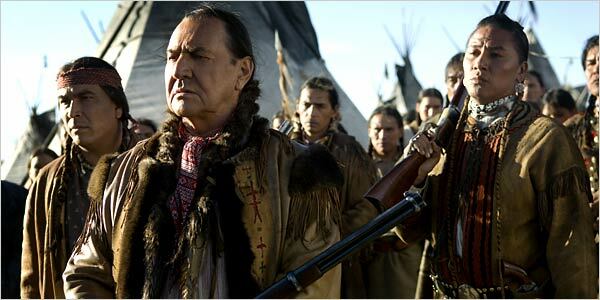 The story is told primarily through the eyes of the protagonist Charles Eastmen (played by Adam Beach), and Americanized Sioux doctor based on the historical Charles Eastman (1858-1939). Overall this film was pretty good, and that is saying a lot for a traditionally minded Catholic who is extraordinarily picky about his movies. The film is mostly accurate to history - the role of the main character in certain historical events is exaggerated, but this is done thematically so that we see the film unfold through the lens of a single man's experiences. But as far as I can tell, most of the events portrayed and the characters involved in them are true to history. Last year I spent a month or so doing some in depth study of Native American culture in the plains and of the Indian Wars in particular (my great-great grandfather was in the Indian Wars) and found this film to be pretty true to what I read. Although you never can be sure in modern depictions of the Native American since the establishment has a vested interest in exalting the Indians and making the Americans look barbaric. Maybe that's really the way it was, but you have to be wary of anything coming out of Hollywood on this subject. Presumably because this was originally an HBO made for TV movie, it carries no rating. It would be PG, but for the unfortunate fact that the very first line of the movie contains an "F-bomb." Other than this F-bomb in the first line, there is no other profanity in the film and no sexuality. It's rather unfortunate that the writers thought this was necessary - it isn't even a substantive line. If you are watching it with your kids, perhaps turn the volume down until after you see the characters speaking for a moment. But other than the F-bomb, I'd say this film was certainly acceptable for children 10 and up. There was a good deal of violence, none of it very graphic. However, the nature of the violence was somewhat troublesome - army shooting unarmed Indian women and whatnot. There's also several scenes of young children dying from smallpox, whooping cough, etc. The most problematic aspect of this film for a young viewer might just be the tragic and disturbing nature of the whole tale - at the beginning of the film, the Sioux are healthy and plentiful living in the Black Hills in the traditional manner; by the end, we see them drunk and sick, wearing American clothes and confined to a pitiable welfare-state reservation where their most minute activities (like whether or not to plant crops) are regulated. The film ends with the brutal massacre of Wounded Knee (1890), and I can see some young kids being disturbed at this whole plot development. The Indians are consistently portrayed as the "good guys" in the film, and if so, this is one film where the good guys definitely do not win. Christianity is portrayed ambiguously - the good motives of the Christian characters in the film are evident, as well as the ideals of the teachings of Jesus; but as is now done ad nauseam in these type of films, there is several pointed contrasts made between the teachings of Christ and the poor way in which the Americans involved in Indian affairs put them into practice. Christianity comes off much better in this film than the followers of the bizarre Ghost Dance cult, who are portrayed as desperate and guillble. The plot is simply the history of the decline of the Sioux in the west. The historical narrative is told through the lives of four characters: Sitting Bull (August Schellenberg), Senator Henry Dawes (Aidan Quinn), who is in charge of Indian Affairs, Elaine Goodale (Anna Paquin), a poet and eventual spouse of the main character, Charles Eastman. The plot can be broken up into four distinct segments: (1) Little Bighorn and its aftermath, (2) the flight of Sitting Bull and the Sioux to Canada (3) the education and return of Charles Eastman to the west to work on the reservations (4) the Ghost Dance movement and the events leading up to Little Big Horn. Charles Eastman is meant to be the main character; Eastman is a Sioux boy who is sent east to be trained as an American and is taken under the patronage of Senator Henry Dawes, the originator of the Dawes Plan, which established the reservation system in the Dakotas and paved the way for their incorporation into the Union. Eastman, educated in the east and and erudite scholar and doctor, is sent back west as an example of what an "educated" Indian can be. 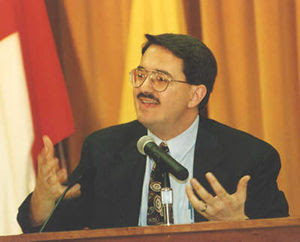 At first he is a supporter of Dawes' vision of Americanizing the Sioux as a means of saving them, but when he sees the poverty and injustice rampant on the Sioux reservation he becomes a bitter critic of the government's treatment of the Indians. In the end, he winds up as an unwitting spectator and witness to the atrocity of Wounded Knee. This is the overall plot, but though Eastman is meant to be the main protagonist, the character of Sitting Bull tends to dominate and overshadow that of Eastman, and significant portions of the movie focus on him. This does not detract from the enjoyability of the film, but it makes the plot kind of jumpy in some places (as it alternates between Sitting Bull and Eastman), and kind of dragging in others, when it focuses for long stretches on Sitting Bull apart from Eastman. Those who enjoy films like the "X-Men" and the Sam Raimi "Spider Man" movies will recognize Anna Paquin (Rogue from X-Men) and a brief appearance by the memorable JK Simmons (J. Jonah Jameson from Spider Man). There is also a cameo appearance from Wes Studi, ubiquitous villain of many Indian movies, remembered especially as Magua in "Last of the Mohicans." He has a brief role as Wovoka/Jack Wilson, the Paiute Indian who started the Ghost Dance movement. The costumes and sets are alright, but they look a tad bit Hollywoodish. Some of the Indians look like they are played by Italians, and the main Indian character of Sitting Bull is played by August Werner Schellenberg, a Swiss-German who is only partially Mohawk. In this it lacks some degree of realism. Also odd is the way in which some of the Sioux characters speak Sioux when talking to white people (Eastman greets a white audience in Sioux early in the film), but when the Sioux are shown speaking among themselves, they speak English. In my opinion, it only detracts from the realism to have speakers of another language speaking English - kind of like when we see Tom Cruise in his absurd "Valkyrie" movie attempting to play Count Stauffenberg but speaking American English. Don't get me started on that stupid movie. Anyhow, this is a pretty good film is you see it and want to watch something educational and entertaining for the evening. The real problem isn't that it was done bad, but that it could have been done better. I give it two out of three papal tiaras. Papal Masses as "liturgical paradigms"
Number one. The pope is very clearly stating that his own liturgies are meant to be instructive. This means that when he decides that all communicants at papal masses will receive kneeling, or that he will celebrate Mass ad orientam in the Sistine Chapel, he is not simply doing these things because he is an antiquarian who happens to personally have a taste for them. When he celebrates ad orientam, he is saying in effect, "I am doing this to show you what you should be doing." This should give some ammunition to priests or bishops who want to institute these practices in their own parishes - the pope has stated that he is intentionally setting an example that he wishes the faithful to follow. I think this is common sense, so I'll move on to point two. Those who follow papal ceremonies probably use them as a measure of accord by which the liturgy must be measured. In effect he is saying, "I know that my liturgies will be used as examples to follow regardless of whether I want them to or not; therefore, I'd better make sure all my liturgies give positive examples." This provides the justification of the well-known disdain of trads for the masses of John Paul II, which were frequently the scenes of grave liturgical abuse (click here for a video of JPII's World Youth Day Mass from 1995, and watch around the 0.55 - 1.20 area to see liturgical dancing and a weird neo-pagan incensing from a bowl). This is one reason why I think that John Paul II, for all his personal piety and self-service, failed fundamentally as a shepherd of the Church. Pope Benedict points out the obvious truth that people will mimic what they see the pope doing - what does it mean then when John Paul II declares in encyclicals like Redemptionis Sacramentum and Eucharistia de Ecclesia that liturgical abuses are to be curbed immediately but then permits them at his own masses? We can only conclude one of two things: that John Paul II was terribly naive or else he was just a negligent pastor. However you slice it, John Paul II's liturgical administration was definitely not praiseworthy. I'm not going to say that this alone makes or breaks his papacy, but it should definitely be taken into consideration, especially when questions about canonization come up. Papal liturgies should be teaching moments, Benedict reminds us. The pope should do the liturgy the way he wants the Church to do it. He ought not to do a liturgy one way and then tell the Church to do it another; it was doing precisely this that led to the confusion of the JPII years. Hopefully we will see more bishops and priests taking the pope's liturgies as paradigms around which to structure their own masses.